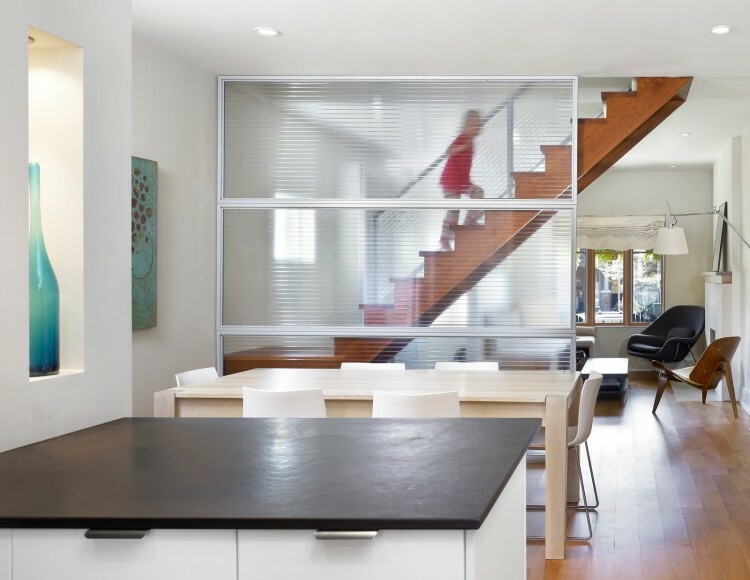 Located in Toronto’s Beaches neighbourhood, this small three-storey semi-detached house had been divided into separate apartments that were deficient in natural light. 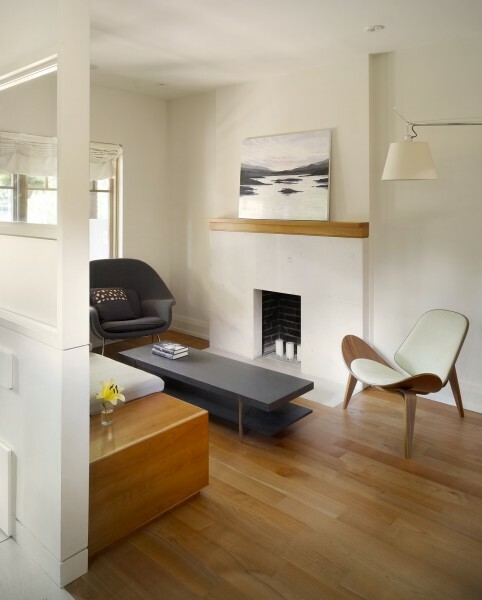 At only 13 feet across at its widest point, the project challenge was to restore the house to a single-family residence, while enhancing natural light and expanding its living space without increasing the home’s footprint. 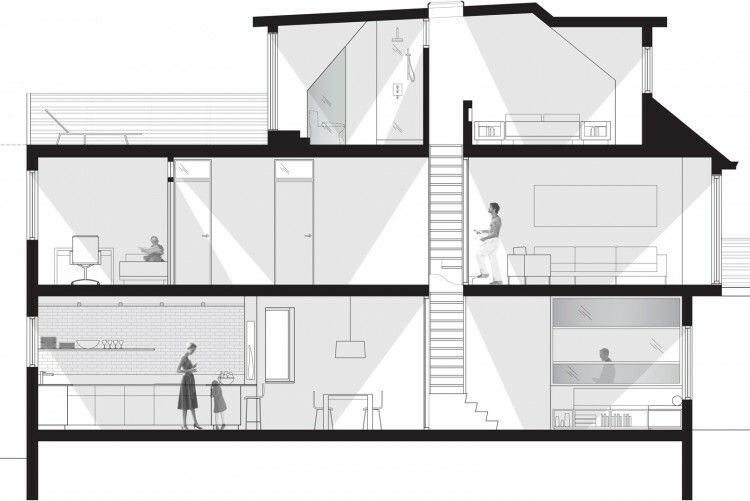 The design solution abandons conventional rooms for open spaces divided by built-in furniture and translucent partitions, while employing numerous means of drawing natural light into the heart of the house. 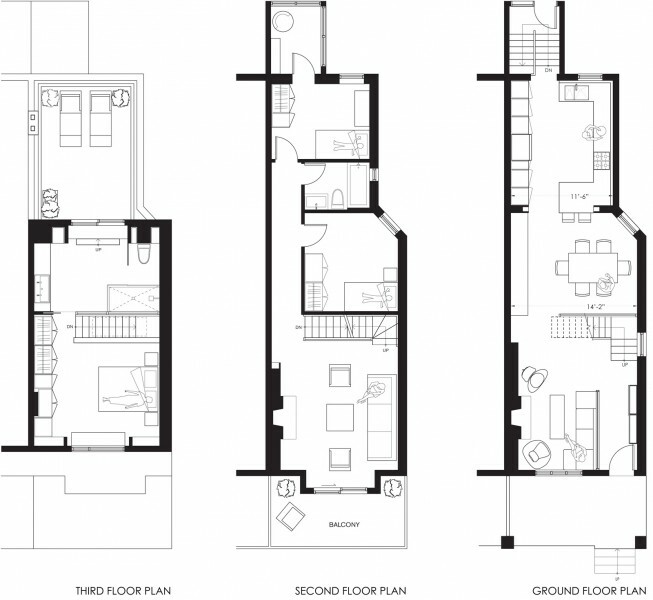 On the ground floor, an open plan is delineated by a new central open-riser stair which divides the living and dining rooms while allowing views between them. 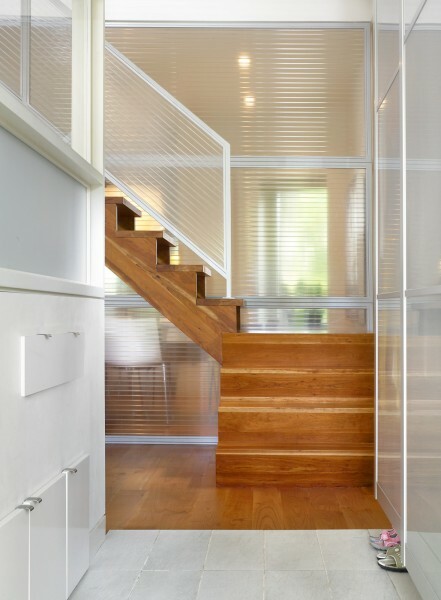 The stair, defined by clear acrylic partitions and paired with a generous overhead skylight, cuts through the centre of the house and illuminates the interior like an internal lantern. 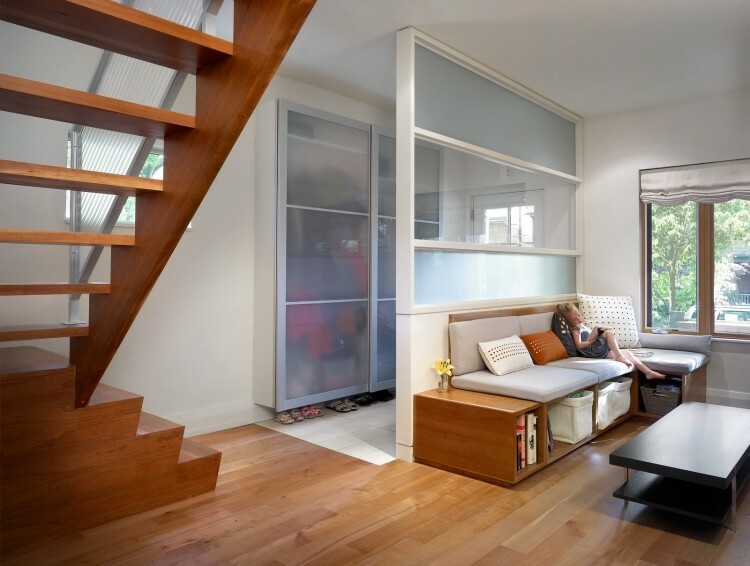 On the second floor the open stairwell passes through a spacious family room, drawing activity to the centre of the home while also finding a more generous living space than the ground floor could allow. 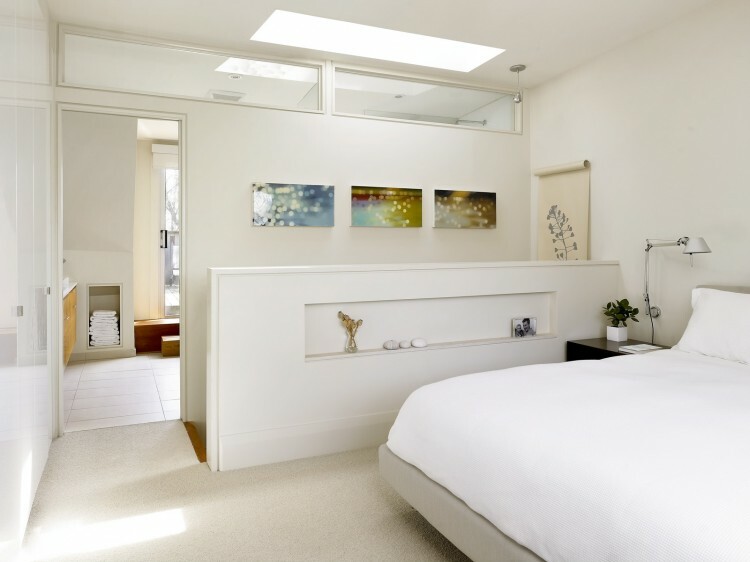 Transom windows above the bedroom doors filter light into the hallway, further amplifying natural light in the interior. 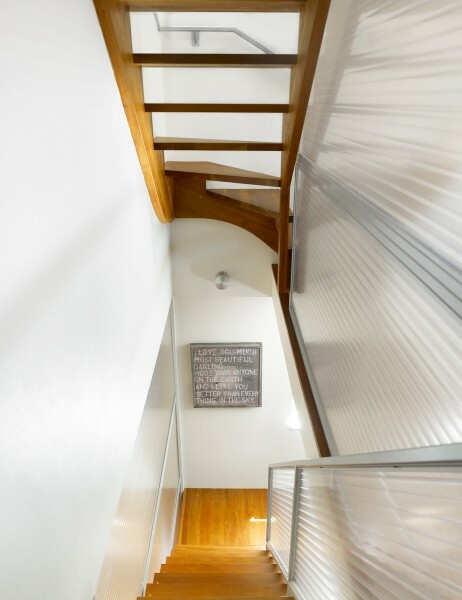 The stairwell culminates on the third floor, which houses the master suite, illuminated by an overhead skylight that creates a light-filled secluded retreat for the owners. 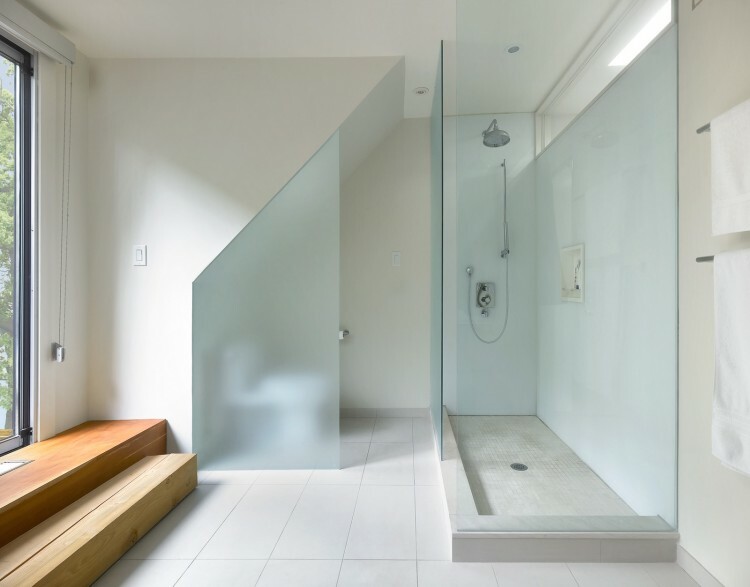 Passive cooling and natural ventilation are maximized through the use of operable windows and the skylight, coupled with an open plan and open stair risers, critical for maintaining thermal comfort in a three-storey home without air conditioning. The optimization of natural light throughout also results in lowered energy consumption through the reduced reliance on artificial lighting. 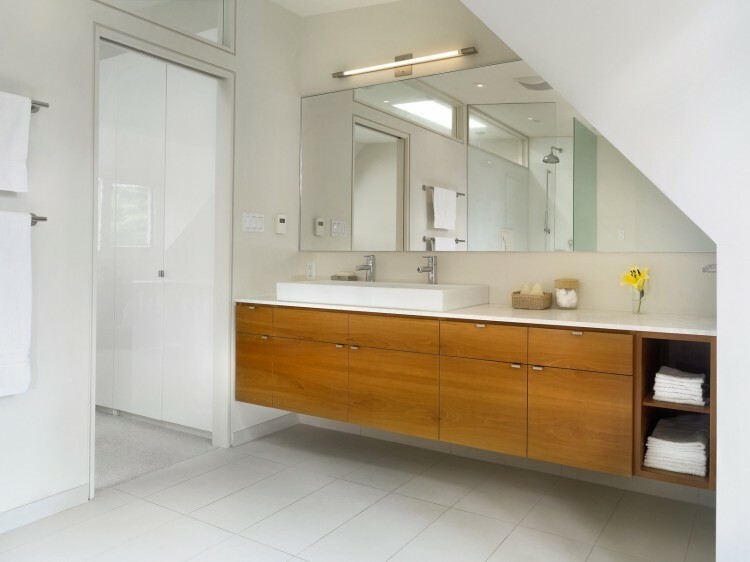 The resulting illuminated interiors provide a fresh and highly functional solution for urban living with a smaller environmental footprint.